The mission of the Akhmim Mummy Studies Consortium is to advance knowledge of ancient Egyptian mummies from Akhmim and other regions. We use our findings to increase understanding of the processes and rituals of Egyptian mummification. Historically, the Consortium's work has focused on mummies excavated in cemeteries located east of the town called Akhmim, known in late antiquity as Panopolis. The ancient population of Akhmim has fascinated scholars for decades. 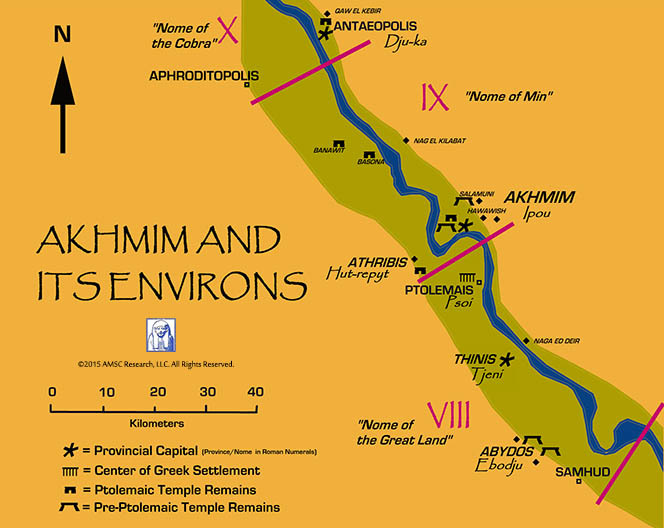 Located 300 miles south of Cairo, Akhmim was a major center of the cult of the god Min. This deity was integral to Egyptian religious concepts of fertility and resurrection. Many of the mummies under study by the Consortium belonged to the priesthood of Min. Since 2005, the significance of these mummies is being carefully assessed using modern CT scanning and 3D printing technology. 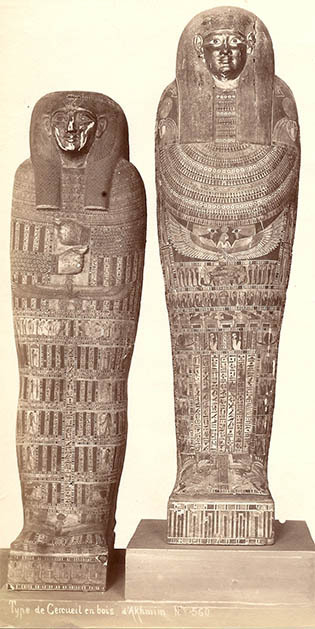 G. Lekegian: Akhmimic coffins, c. 1890 ©2015 AMSC Research, LLC. All Rights Reserved. The Akhmim Mummy Studies Consortium engages in active collaboration with qualified institutions and individual scholars. Collaboration can take the form of co-publication of scientific results or production of models and sculpture to achieve research goals or for exhibition purposes. Museums which own mummies can gain enormously from the Consortium’s assistance in their projects, since the Consortium has archives relating to many different aspects of mummy-oriented research and related areas of radiographic history. Map of the Akhmim Region ©2015 AMSC Research, LLC. All Rights Reserved. An important aspect of the Consortium's work is the creation of the Community of Portraits using modern methods of forensic facial reconstruction and CT-based modeling. The Consortium believes that such reconstructions provide clues to the ethnicity of the population associated with the city of Akhmim. Our work allows us to explore the ethnic diversity of ancient Egypt more generally. We began working on the Community of Portraits in 2005. Renowned forensic sculptor Frank Bender (1941-2011) produced our earliest portraits, four Ptolemaic females and one Ptolemaic male. The Consortium later commissioned N. Eileen Barrow of the FACES Lab, Baton Rouge to produce three other portraits, a Saite Period female, and two Ptolemaic males. The Consortium maintains an archive of materials relating to the historical aspects of mummy analysis and the relationship of mummies to the field of Egyptology. To contact the Consortium with questions relating to mummies or other objects of archaeological interest, please email: director@amscresearch.com. The Consortium conducts on-going investigations into a variety of topics and welcomes inquiries from informed scholars.